is greeting me every time I enter my flat. It has had its place at the far wall of the living room for the past two years. It is my window to elsewhere; it's my window onto the fields where I grew up; not just the fields, but them on a hot high summer afternoon; when you can smell the summer as it hits your skin. The kind of summer I haven't had for a long time; but whenever I get a scent of them, once or twice a year, it is so welcome. But for the past two years, I've got a scent, just a hint, of them whenever I enter my flat. Mark's book, Raw Colour with Pastels, had just been published when I stumbled across it on Amazon: a book on pastel, a book about abstract pastel landscapes. And it was ordered. And it proved important, resourceful, inspiring. It isn't a how to do book but much more of a biographical account of why pastel and colour matter to this artist. It's a bit similar to a good autobiography that isn't really constructed as such. So, I learned how to prepare my own grounds with pumice powder and acrylics; how to simplify layers and: how to paint fields, lines, more fields, more lines. Really, a lot of the first bits of landscape abstraction have come from that. 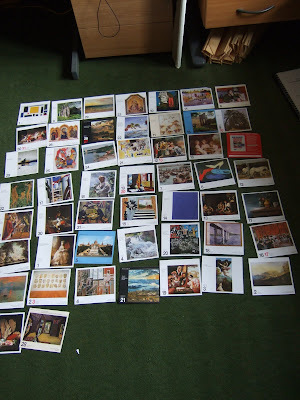 I discovered that Mark's paintings were still available in a variety of places - as I said, the book had just been out, and thus many of the paintings were still for sale. More by luck than anything else I stumbled across the site for St Mary in the Marsh. Blindly and wholeheartedly I had fallen in love with it. 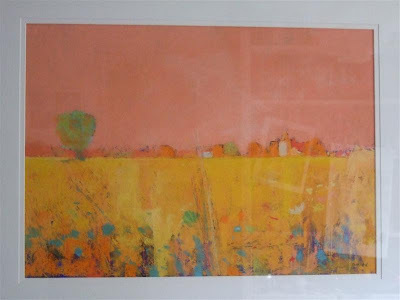 It was the singular colour of the sky - an otherwise ugly salmon pink which in another life was THE colour of the late 1980s and for good reason still has to make its comeback - , the almost halfway horizon line, the yellow of the field and the splashes of cobalt in the foreground. So I did something I hadn't done ever before: I sent him an email, and in the end bought the painting - I don't think I ever told my parents that I did that. In the process, we exchanged a few emails and I had been planning of visiting him in his studio south of London - even remember researching a tedious set of public transport connections to get there from central London. Brian had just written a post about Mark Leach's book. In this he mentioned that Mark had died in early July. Dear Mark, thank you so much for this painting and for the hint of a hot summer afternoon in Bokel in my flat! And for showing me the possibilities for abstraction in landscape, colour and lines and simple fields to paint the things that matter! ... so she said after I had sent her some snapshots from the prints I was truly excited about. Well, admittedly, I. only got two small, poor lighting pics sent over IM for a quick look. But nonetheless, it left her very unexcited. Even to my comment that most of the times still life doesn't rock, really she replied: no, some of them do. LOL. 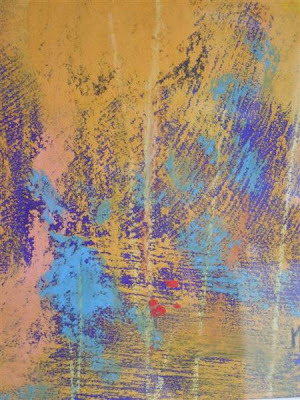 That leads on to work process: Assignment One of the printmaking is on monotypes; it's set out in such a way that there are four projects: markmaking; masking; textures/different colours; freestyle. Markmaking made me crash into hurdle #1: mixing ink, keeping ink fluid and getting a good print - it was really about painting on the plate and taking a print. I tried, tried some more and failed some more, and quickly moved to project #2 [which turned out a lot better, see here]; I kept reading on to the freestyle bit and quickly came up with ideas for the four freestyle projects to do, starting sketches, collecting things to include and general plans for that. In the meantime I kept playing around with the inbetween parts: masks, different masks, different colours with different masks, collecting more leaves, seashells and other things for texture etc etc. So, project 1 was still lacking 'a still life including two objects, negative space and shadows'. After six, seven attempts at various jugs, plants, cafetieres, pears and some more, I had previously given up. So, when I then turned to that dreaded still life including two objects I chose colours (orange and green) and objects (orchid) which had worked well in the masked prints. And, heyho: I have a print that does work in terms of composition, it's a reasonably clean print, has two objects, shadows and negative space. Well: it doesn't rock, I agree. But in relative terms it does well. And: it completes the task. I think the painting on plate bit is too painterly for me; I like the roller, sponge, water stuff better. But more of that later. Now onto the prints for freestyle, jippieh... good that I have some ideas. ... new colours, new shapes... slowly getting to grips with the different paper - one is blotting paper, one a Chinese paper. The orange works very well, but I'm unconvinced by the purple - too muddy, really. Probably the napthol red to blame for that. I want a MAGENTA! Twombly wasn't really painting loss in Hero and Leandro, or was he? What he did was taking a poem based on Greek mythology and wove a different narrative for it. It was one of loss and sorrow. But nonetheless a far removed one all the same. Yet, a couple of rooms before Hero and Leandro - and about ten years earlier - he was painting some of his own loss in Nini's Paintings. A series of five huge, 300x260cm tall, canvasses, in response to the sudden death of his gallerist's wife, Nini Pirandello, in 1971. They are all there is in the room, apart from a bench. They are all part of the same. Tall, wide, repetitive: scrawl upon scrawl upon scrawl on beige canvas. Unlike many of his other series, these five are so similar - it is difficult to discern which preceded the others. There is no numbering, no development. They are all simply Nini's Paintings. And that is important: it doesn't matter. It's melancholic sadness that repeats itself, over and over and over again. Not just across the canvasses, but in layer upon layer. Much of the commentary on Twombly's work process remarked on such layering right throughout his work - the white housepaint that is used so frequently to undo what was before, e.g. also in the Poems to the Sea, or the centrality of the whites in Hero and Leandro, notably in Hero's drowning. It's gone and still it is there. Joane Eardley's work process was also driven by such layering: of paint, of dirt, of collage - in fact, any collagist actively builds this into her work process: to build up history, narratives, stories through such layering. In many ways it's probably too neat an image - one of the things I like about collage or mixed media is the fusing of different layers, how they become something new, one, many, rather than staying separate. Well, and that kind of goes back to mourning. The catalogue's opening paragraph on Nini's Paintings refers to Freud's 1915 essay on Mourning and Melancholia*. How, with any loss, mourning goes through all the previous ones to finally arrive at the most recent. [Well, and his argument is that melancholia occurs if that isn't happening right]. So, there is a layering, recalling, rewriting and perhaps fusing of past experiences. Working the way through the various rounds, experiences of loss... scrawling a name, different names over pages, over and over, whitening them out, adding new ones on top. And at some point the painting is done. Well, done in the sense that it can remain as what it is. And one can look at it. It's funny. I read most of this when I was back home. But I remember the sheer physicality of those paintings in that room. Me sitting on that bench in the corner, they all around. It was about acknowledging the presence of something important. Paintings I like? No, they are not pretty nor nice. They are important. ... besides the first working examples of my masked monotype experiments? Do you know? They are representations of something, but of what? I've been quickly filling the washing lines spun across my flat, so if you know what they are: leave a comment and the first one with a right answer will get one of them sent. Ok - I've been carrying this one around with me for a good while, so I reckon it's time to put it on paper. There were two rooms - or rather two series - in the Twombly exhibition that didn 't leave me. For this first one, I briefly contemplated filing it under my Paintings I like tag. But that doesn't capture it. It doesn't get to it at all. There is something terribly wrong with LIKE in this context. It's far more complicated than LIKING implicates. Liking is niceness; prettiness; oh, that is kinda cutesy. Well, there is something really aesthetically appealling about the series of four paintings - or rather: pieces of art - that constitute Hero and Leandro. Just looking at them from a distance. A wave, viridian and a dark magenta crimson, rising up on the left...... calming, calming further until it is white nothingness - thick textured off-whites layered atop of each other to the far right of the three pieces in oil. Large paintings they are. Intricately layered in oil with the white and the wave and the green and the dark red. Violent calm it seems to shoutwhisper. "He's gone, up bubbles all his amorous breath"
- a line from Christopher Marlowe's poem which gave the inspiration. The concept? It's so obvious that it sticks; unsticks the beauty of the piece wholeheartedly. Leandro - the lover of Hero - crosses the sea to visit his loved one. One night he drowns. In despair over his death, Hero drowns herself in sorrow and the sea. Do you get it? He dies in a bloody, green wave of powerful mediterranean water. She in contrast simply vanishes into white nothingness, demurely, obediently, the nothingness engulfs her sorrow. I kind of see Kate Blanchet in all her white Lord of the Ring otherworldliness walking into a calm lake, all glowy and sacrificial. A painting I like? No. Nobody drowns in waves of blood, unless you've been hit over the head beforehand. Your lungs just fill with water, no blood, just no air. And then a body is washed ashore within a couple of hours and not only in three weeks, if one's lucky. I know that bit, and I wish I wouldn't. But that isn't the point. How boringly does he think he can go and construct gender? Yawn... active/ passive, red blood/ white sorrow... C'mon Cy! I'm sure you could have done something a bit better on this one! It's not even an old piece, you did this in the early 1980s! No?! It's just a shame that it's an awfully attractive - beautiful - series of paintings. Liking? ... far too nice for it. ... all across a white page. Remember Twombly's mention of Mallarme's thoughts on the role of a blank page as significant for what's written on it? I had been eyeing up my post counter for some time. 2007 had 99 posts, so 2008 would need 100 and the next post would be number 200. I was very good at that, I really was! But then, some lapse in attention, and here we go. This is post #202. That's a good number also, seeing that I ignore anniversaries etc. That's quite a bit of writing in 15 months. Often I'm not quite sure where this is going, or I for that matter, but the dynamic the whole thing gets from that is rather good for it, I think. Should I look back and summarise 202 posts? Nay... have a look at the posts on the right-hand side for that matter, and make up your own mind, should you care. But, here's something I kept quiet about for almost a year: It's a woodprint I did last autumn at a course at the Glasgow Print Studio. Over eight weeks, the Japanese plywood acquired plenty of carving (much in wrong places) and plenty of oily ink. The tactile stuff of carving, inking, and actual printing was just fabulous. I really enjoyed that. I initially had thought of printmaking merely as an underpainting kind of stage for the mixed media or pastels paintings: get some planes, shapes and colours done to continue working with them. More than 3 colours seemed an excessive amount of detail and forward planning. But it was really enjoyable. 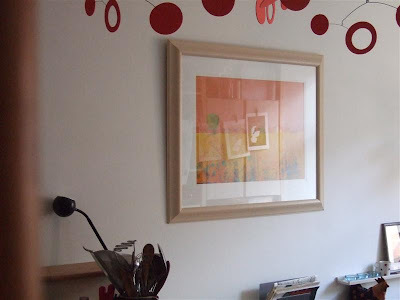 So, in Spring I signed up for a course on Printmaking - to be done in my kitchen. It's a course with the Open College of the Arts. In addition to a messy kitchen I have also acquired an art school student status. Hurray! Mind you: distance and part-time, but nonetheless. It was a bit slow to get going (or was I?). However, since I've been back home, I've been inking up my kitchen counter to do some monotypes. Well, they are experiments, and to date pretty much all failed experiments: no, that wasn't enough ink; oops, what does that colour do there? ; argh, no: that's the ink dried now; oh dear, not enough pressure; hm, too much water, etc, etc. That makes them perfect for using them as base for other things; yet, I'm sure it's not really something my tutor is looking for. So, nothing to show for those just yet. That much for the now and next, and I'm sure at post #404 there'll be a big tag on PRINTMAKING. And some other things, too? Oh, and of course: Thank you for reading, commenting and showing me a world of fascinating art along the way. Cheers! ... about all the found papers. Only got sidetracked by too many other things. Remember? In May I optimistically announced that anybody who had any papers to send to me should do so URGENTLY as I wanted to finish the books before mid-July. Well... nothing happened despite my optimism. Well, that's not true: I did get a number more envelopes in the mail. When I was in Berlin, I picked up a rather adorable collection, and for a weekend, everyone kept passing any sort of found paper on to me. Thank you, again! So, I put them all on my floor last weekend, to kind of get me back amongst them to see what to do with them. I had a few ideas kicking about before I had left in June. But... hm... nothing happened. There were all these papers and I didn't have a clue! A couple of hunches at best but definitely not enough to run with them. To get me at least slowly walking again, I've now uploaded the third book which is finished: well, cut apart, not strung together though. Compared with the two first ones, it's white and a bit sparse, but features some candle smoke, sand and some authentic dirt on the architect's plan. Well, next weekend I can start walking faster, I reckon. Let's see where to. Nine years ago I was in Germany for four months, after 10 months Glasgow after 18 months Germany after 12 months Glasgow - and this was what embodied it in song: Well, well and truly inbetween. I'm not there that often anymore, but this summer left me arriving in London and there it was again: stuck between the worlds. The produce in question: of course the cornfield. While the last attempt yielded long grasses, it was far too wild and rugged for good German, intensively fertilised corn. So, rather than pursuing Brian's good advice for variation, I veered intensively into the opposite direction: repetition, repitition, repetition (which figures as another point on his list). So much so that I felt I was doing a caricature rather than a pastel painting. That wasn't a bad feeling, though: I'd love to be able to do them, but again: a lack of illustration skills gets in the way. I think so. But all the same, I notice something majorly wrong with this. Do you see it? A hint: try to figure out time of day, direction of sun etc - usually the practicalities I don't bother with too much when I pick hues/values I want to. But with this one it struck me afterwards - too much realism gone wrong: The trees are getting full on sun from the left (south east) while the distance is almost in an evening/dust type dullness. Doesn't quite work, does it? Will fix it, though. And then let cornfields be cornfields for a while. ... and some more on Twombly and his favoured poems. Thinking about it, it's probably unsurprising that there'll be plenty of Rilke thrown into the paintings of sea, shores, water, seasons, love and loss. Rainer Maria Rilke. I heard (as mp3s) some of his autumn poems last autumn and then fragments of his work, notably his Letters to a young poet and more poetry came flying from various sides. Part of that was an exploration of how much easier music and visual art is for expressing stuff that otherwise - in written verse - ends up just tediously soppy. So, joyfully on to the tediously soppy now - thank you, Cy! There were three fragments of poetry that caught my eye in the exhibition. First, there was a line, scrawled on the bottom of a bronze sculpture representing a broomstick and various other bits. It falls down the stick, doesn't it? Prosaicly, slowly, drib drab like treacle. It's written across the opening panel of Untitled (A painting in nine parts). "As if standing on fishes." I liked the idea a lot. How comforting, I felt it was. - It was about buoyancy: finding the balancing point of where one would stop sinking any deeper. After all: the fishes would prevent one from sinking. I smiled to myself, went back to read it again towards the end of the exhibition. Bob, bobbing along as you float, halfway in water. I stumbled, sunk. Deeper and deeper. Was there not going to be any buoancy after all? I talked it through with M., she couldn't see anything buoyant in the English verses at all. So I gathered that I must have optimistically misread it. It's a line from the poem Fortschritt - progress. Progress, kind of turned on its head if you think about happiness drib drabbing rather than moving upward. Funny that. wieder rauscht mein tiefes Leben lauter, als ob es jetzt in breitern Ufern ginge. Immer verwandter werden mir die Dinge und alle Bilder immer angeschauter. Dem Namenlosen fühl ich mich vertrauter: Mit meinen Sinnen, wie mit Vögeln, reiche ich in die windigen Himmel aus der Eiche, und in den abgebrochnen Tag der Teiche sinkt, wie auf Fischen stehend, mein Gefühl. And, with this I'm sure it's about buoancy, about stretching upwards and downwards. Standing on fishes must be a good thing, I'm sure. Now, the third fragment? That's for Hero and Leander. And I'm sure there must be plenty to be said about such elevation of heroic emotion, a single being cast out in the world, their loneliness and abandon to their inner worlds, emotions and all that. Just as well as I'm sure there's plenty of literary criticism, social sciencey stuff and feminism to take it apart. They were done as part of the early colour investigations before all those fields in oil earlier this year.. I had six of them framed in a wooden, deep, double frame before the exhibition in June. Small squares they are quite impressive that way. On my list for things to do this autumn was the concerted effort to recoup some of my extortionate framing costs from before the June exhibition. So, all my paintings - small and large (if they are not going to some local sales/exhibitons) - are being put onto Etsy. I've also promised myself to do the same with the various plein air sketches I've done for the past 18 months or so. Vivien's shop opening prompted me to grit my teeth and write up descriptions for various things. And the first new items to go in are the Coloured Squares. And, I'm diverging from my straightfoward naming conventions of anything serial. So, rather than merely calling these CS#23 or thereabouts, they are COLOUR on COLOUR. This morning I finally took out the easel again after a while. I took out one - the only red! - already prepared greyboard (acrylics and pumice powder). The bulk of the cornfield still kept me wondering - and the comments I got to my earlier request here pretty much went along the lines: yes, something I'd like to know about also. Ok. My rationale was to do more persistent, stronger lines rights throughout the field, and to do them in acrylics - in highlights and lowlights. I then split the field into... hm, well,... really into a side view and a top view, trying to construct it somewhat 3d. While that wasn't the view I had IRL, it still seemed an appropriate way to counter the flatness. In went a lot of repetitive marks - lines, about an inch long, overlayed and varied across the field. For the foreground, I put in much longer lines. Then I went back in to really work on the negative space by adding a lot of dark values in the foreground - to work on the illusion that one could see into the undergrowth. Well, it's not flat anymore. I did prepare two panels with a similar underpainting. With the second one I'm thinking about constructing the field much more obviously 3d in acrylics before I start with the pastels. Would that work? Can you see the time? How it passes, slowly, quickly, a jump here and then it stands still? My mind's been running circles around a couple of abstractions: concepts and prepositions - too much post-structuralism to deal with relationality. The connections between things. It's still running, mind you. My first venture into it was the idea of island time when I was on Eigg: moving differently, circular not linear, depending on the tides and the ferry. Yesterday at lunchtime another representation of it occurred to me. I finally had opened all my mail at work from the past six weeks, had decluttered my inbox - less than a hundred seems to be the definition of that, and finally I turned attention to my calendar. It's a daily one with a piece of art for each day. Stubbornly it proclaimed: Gesa, don't worry, it is only 9 July, you're about to go to Eigg, to Berlin and the summer is ahead of you. The summer on my office floor. Can you see the time as it passed? Catching time, making it stand still while it falls apart was at the centre - see the clock hands - of a collage piece by Paul Klee I saw in July in Berlin. It's definite timing: five minutes to seven o'clock. It sits across jumbled, skewed rectangled shapes of various shades of yellow, red and brown, fabric, plaster and paint. It's an inconspicious piece amongst to many other great pieces in the exhibition. And still, it nags you persistently: What to do if time stands still at the wrong moment?? At five to seven. 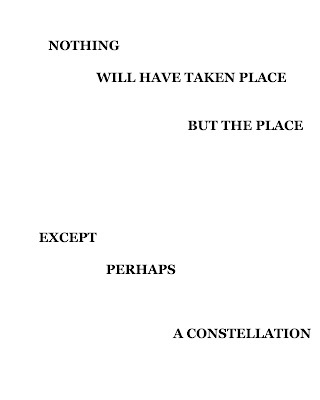 ... so goes the opening line of Stéphane Mallarmé's The Swan. I stumbled across it in some of the notes on Cy Twombly's earlier works in the Cycles and Season's exhibition at the Tate Modern. Stumbled across a whole series of white square drawings in pencil with splatters, splashes and markings of white oil paint. Each of them has a horizon line, drawn with a ruler, just a couple of inches below the top. The series is entitled Poems to the Sea. I thought of Joan Eardley and of Edwin Morgan's poem to Eardley and Floodtide (see post here). So, a whole wall full of these poems to the sea. The commentary remarks the influence of Mallarmé's poetry on these drawings. Notably: a play with words, connotations and sounds. And it poses the question that if meaning is created by the relationship between words and sounds then surely the blank page on which these sit must be part of that relationality also. So, here the white, blank page for Mallarmé and Twombly. I went hunting for the poem. Found it in French alongside some discussions on the difficulty of translation. And then there's the playfulness of so many translations and renderings, to keep the symbolism, to keep the obscurity, the creation of meaning and sounds and rhyme? John Holcombe's review of existing translations into English (see his site here), and various further attempts are intriguing: it is the play with words, meanings and translations which is fascinating in everyday use alone, but just leaves me speechless when it comes to poetry. The virgin, the beautiful and bright today. Snowy cascades of flights not fled away? On the sterile dull glint of the winter's stay. In a space inflicted that the bird denies. How futile is exile for the Swan. So. The first post on Twombly is on whiteness, relationality and poetry. It's the use of words, meanings - almost graffiti-like - that intrigued me in the exhibition. There'll be more on that. There's also some ideas on the playfulness of words and meanings in different languages - how it cannot be translated and the fact that purity of one language is just restrictive. ... not ordinary snakes, no: pythons. I saw them. Not all of them do, but some. I am sure of that. The certainty came to me on a lunch break last week in London's West End. Lunch at the Victoria & Albert Museum opened my eyes. To Frederic Lord Leighton's Athlete Struggling with a Python. So manly, so strong, so determined. Do you see his stare, the muscles on his arms, the strong legs? All enframed by the glittering body of the snake, so smooth, so strong. And still: held at arm's length, they struggle, they stare. Who wins? Because a victory it has to be! The athlete, the snake? So, I went back with the sketchbook, after having watched more wrestling with snakes over the ensuing days. I sketched and giggled. Pictured those academics as snake wrestlers. And giggled some more. But they do. They wrestle with snakes. At least some of them do. ... 80% of the medium has to be (not oil) pastel - that's one of the requirements to enter any painting into the Pastel 100 Competition. (a) I am a lousy photographer of my own work. Most of the pics are poor snapshots of various Work in Progress stages; and then there's nothing until it's framed. Incredibly useful. (b) I was running up against the 80% pastel requirement with all the mixed media stuff I was doing. Most of it figures pastel but some rather sparingly so. Well: there were two likely candidates but no useful photos. So I took my tripod out yesterday and came up - despite the greyest day in Glasgow since about 20 January or thereabouts (or maybe I just luckily missed six weeks of grey?) - with a reasonable setup for taking pictures. My favourite choice was this one from the Colored Sands series. Do you see the problem??? So, the only one I submitted is this one here. It has some acrylic unterpainting which does some nice things in terms of texture. It's the only 80%+ pastel I have. I'm a bit hesitant - even ambivalent - about it. I loved the composition when I finally got to it (see the Study Plains for some talk about it); I also love the lemon yellow and some of the lush marks across the blue fields and the skies. I now also have some good shots of some of the detail in this flickr set (yes, I know, a tripod is a much better option than my shakey, impatient hands). And I need to find a mixed media thingy to submit the glorious Colored Sands #1 to. *An attempt at a less representational title: is it a landscape? No it isn't!